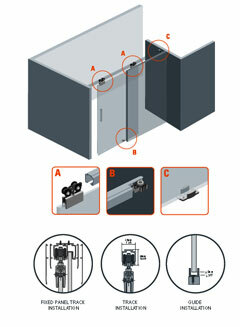 Top sliding system for GLASS doors installed inlay the opening and traveling inline. Compression clamps avoid the need to bore the glass. 176 lbs max weight per door. 2 fixed panels of 3m and two sliding doors of 1.2m will give you a max span of 8.4m (27.5 ft). U21 aluminum track for a silent glide. Fascia for U21 track (accessory) will easily install with a snap providing an elegant finishing. Track for fixed panel (accessory) to be used in combination with Track U21.